These heat-resistant grill gloves help protect hands from temperatures up to 932° Fahrenheit, perfect for cooking, baking, grilling and more. They are made with Aramid, a material used in flame-resistant and heat-protective clothing. The flexible gloves don’t get in the way of maneuverability when you’re at work and a silicone coating gives them extra grippability. Wear a pair to do things like pull hot bakeware—even cast iron—out of the oven or when you’re cooking on the stovetop. The gloves are a great extra layer of protection for jobs outside of the kitchen, too, like around the grill or fireplace. Dimensions: One size: 10" x 7.5" x 1"; Women's small: 10" x 6.5" x 1"
Weight: One size: 0.64 lb. ; Women's small: 0.6 lb. 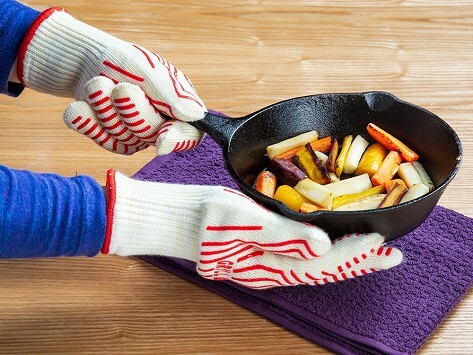 These gloves are great and I use them a lot because I use cast iron frying pans. Grommet prices are great along with quality . There's several items that I'll be ordering soon.